CALGARY, Alberta (AP) — Calgary’s fourth-line forwards provided all the offense the Flames needed against the Ottawa Senators. Andrew Mangiapane, Garnet Hathaway and Derek Ryan combined on Calgary’s second and third goals of the night in a 5-1 win over the Senators on Thursday night. Mangiapane and Hathaway each had a goal and an assist. Ryan assisted on both goals. Mark Giordano scored Calgary’s league-leading 18th short-handed goal. 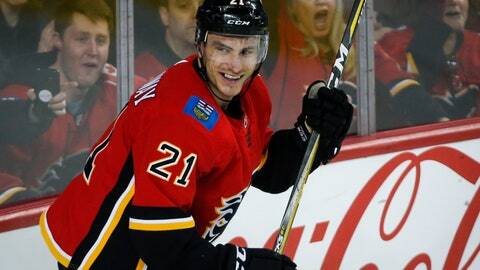 Matthew Tkachuk had a goal and an assist and Mikael Backlund also scored for the Flames. Mike Smith made 18 saves for the win in a game pitting the top team in the West against the team with the worst record in the East. Calgary opened up a five-point gap on San Jose atop the Pacific Division. The Sharks dropped a 4-2 decision to Los Angeles on Thursday. The Flames and Sharks clinched playoff berths earlier this week. Ottawa dropped to 3-6-1 since Marc Crawford took over for the fired Guy Boucher on March 1. Crawford said Calgary didn’t play a great game, but played the right way. “They stop in the right places, they move the puck the right way, they support each other the right way, and their fundamentals stopping at the net at both ends are something that we’ve got to get to,” Crawford said. Mangiapane scored his second goal in as many games, taking a cross-ice pass from Ryan and scoring over Anderson’s glove nine minutes into the second period. Mangiapane started the season with Calgary’s AHL affiliate in Stockton, California. The 22-year-old from Bolton, Ontario, has seen his ice time increase in the last six weeks as he and his linemates have become key contributors. “It helps when you’re playing with two great guys and building up chemistry,” Mangiapane said. Mangiapane, Ryan and Hathaway capitalized on an Ottawa turnover in Calgary’s zone in the first period. The trio rushed the puck up ice and Hathaway finished with a tap-in for a 2-1 lead. “It was a pretty play and I was lucky enough to be at the end of it,” Hathaway said. “Pretty much whenever we’re on the ice, we know what the right play is. Giordano’s short-handed goal that pulled Calgary even in the opening period was his seventh point in six games. NOTES: Sean Monahan (illness) and Sam Bennett (upper-body injury) returned to Calgary’s lineup after missing two games, but Bennett did not play the third period. … Giordano moved into second in all-time games played as a member of the Flames (827), behind Jarome Iginla (1,219). … Senators forward Jean-Gabriel Pageau served a one-game suspension Thursday for boarding Canucks defenseman Ashton Sautner on Wednesday. Senators: At Edmonton on Saturday. Flames: At Vancouver on Saturday.